An outward and visible part of religion embracing ceremonies, words, and material things producing an invisible action of the Holy Ghost. The name "sacramental" was given to rites which have some outward resemblance to the sacraments, but which are not of divine institution. Sacrifice is an act of external worship in which God is honored as the Principle and End of man and all things, by the oblation of a visible creature, by submitting it to an appropriate transformation by a duly qualified minister. The violation of a sacred object. The Council of Trent teaches that “the saints reigning with Christ offer their prayers for men to God; that it is good and useful to call upon them with supplication, and, in order to obtain benefits from God through Jesus Christ, who alone is our Redeemer and Savior, to have recourse to their prayers, help, and aid." The prayer which we may address to the saints is of course wholly different from that which we offer to God or Christ. "We pray God,” says the Roman Catechism, “Himself to give good or free as from evil things; we ask the saints, because they enjoy God's favor, to undertake our patronage and obtain from God the things me need. Hence we employ two forms of prayer, differing in the mode, for to God we say properly, Have mercy on us, Hear us; to the saints, Pray for us." Or, if we ask the Blessed Virgin or the saints to have pity on us we only beseech them to think of our misery, and to help us "by their favor with God and their intercession"; and "the greatest care must be taken by all not to attribute what belongs to God to any other," Two points, then, are involved in the Catholic doctrine – the intercession of the saints and the utility of invoking them. The antiphon said after Lauds and Compline from Trinity Sunday to Advent. The part of the church round the high altar reserved for clergy. The Sanctus forms the conclusion of the Preface in all the liturgies. A dress which covers the shoulders. But it is best known among Catholics as the name of two little pieces of cloth worn out of devotion over the shoulders, under the ordinary garb, and connected by strings. A tear or rent (Matt. ix. 16; Mark ii. 21); a division of opinion (John vii. 43; ix. 16; x. 19); party spirit in the Christian Church (1 Cor. i. 10; xi. 18; xii. 25); and then, in Fathers, and theologians, a technical word to denote formal separation from the unity of the Church. The obligation of the confessor in keeping absolutely secret the knowledge gained through sacramental confession. A prayer said by the celebrant in a low voice, which cannot be heard except by himself, after the Offertory and before the Preface. In proportion as the monastic institutions grew and spread, the contrast between the cloister or the cell and life outside of these was more vividly realized, and when the profession of Christianity had become general, the contrast was more marked between the secular and the monastic life. To the clergy of all ranks and orders serving Christ in the world, not bound by vows or by a rule of life, the term "secular" is applied. The extinction of the title by which property, whether real or personal, is held by the Church, and the placing of that property at the disposal of the secular power. It is obvious that such extinction of title cannot justly take effect except with the consent of the Holy See, as representing the whole Church. 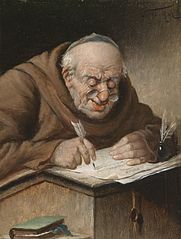 Historically, such consent has seldom been asked or obtained; the utmost concession to equity that civil governments are accustomed to make in such a case is to enter into a treaty with the, Holy See for regulating the compensation, generally a most inadequate one, awarded to the clergy, secular or regular, whose property has been secularized. This has been done in France, Austria, and Catholic countries generally. In England, Ireland, Sweden, Denmark, and Holland, no compensation for the expropriation of Church property has ever been made. A school or college for the training of young persons destined for the priesthood. A rhythm sometimes sung between the Epistle and Gospel; also called a "prose," because not in any regular metre. At first, the sequence was merely a prolongation of the last note of the Alleluia after the Epistle, till, to avoid the wearisome effect of such a prolongation, words, appropriate to the occasion, were substituted. St. Bonaventure; he became Minister-General of the Franciscans in 1256. The order of the "Religious Servants of the Holy Virgin," commonly called the Servites was founded in 1233 by seven Florentine merchants, whose names were Monaldi, Manetti, , Amidei, Lantella, Uguccioni, Sostegni, and Falconieri. The three days following Quinquagesima Sunday – the time for shrift or confession. Giving or receiving, or intending to give or to receive, anything temporal for anything spiritual. Any thought, word, or deed against the law of God. This congregation, founded at Amiens by Madame de Bonnault d'Houet in 1820, under the direction of the Père Varin, of the Company of Jesus, to labor for the sanctification of souls and the female education. A religious congregation or association consisting of lay persons, male or female, or both male and female, meeting together at stated times, under ecclesiastical direction, for the performance of pious exercises and recommending to each of its members conformity in life and conversation to a body of rules, framed in order to promote the honor of God, devotion to the Blessed Virgin, the spread of good works, and the spiritual advancement of those who faithfully observe them. The primary principle of life, and by living things all such as have the capacity of motion from within. Persons who, according to the practice of the Church, assist at the solemn administration of baptism, to make profession of Christian faith in the name of the baptized. A series of pictures or statuary representing the different events in the Passion of Christ, each Station corresponding to a particular event. Usually, they are ranged round the church, the first station being placed on one side of the high altar, the last on the other. The Stations are among the most popular of Catholic devotions, and are to be found in every church. Sometimes they are erected in the open air, especially on roads which lead to some church or shrine standing on a hill. The word stigmata signifies "I bear the marks of Jesus in my body." Such marks were set on slaves who had run away, on slaves consecrated to the service of a heathen god, on captives, and sometimes soldiers branded the name of their general on some part of their body. In the year 1228 St. Francis of Assisi was on Mount Alvernus to keep his annual fast of forty days in honor of St. Michael. One morning, says St. Buonaventure, about the 14th of September, the feast of the Exaltation of the Cross, Francis saw a seraph flying towards him. There was a figure of a man attached to a cross between the wings. After the vision disappeared, the hands and feet of the saint were found to be marked with nails, and there was a wound in his side. The wounds were seen by some of the friars and by Alexander IV during the lifetime of the saint, and after his death by fifty friars, St. Clare, and a multitude of seculars. St. Buonaventure assures us that he had the testimony of Alexander IV from the Pope's own lips. The Church keeps a feast of the Stigmata of St. Francis, instituted by Benedict XII. A narrow vestment made of the same stuff as the chasuble, and worn round the neck. The Pope always wears the stole. Bishop and priests wear it at Mass – the priest crossed over his breast; the bishop, who has already the pectoral cross on his breast, pendant on each side. They also wear it whenever they exercise their orders by administering sacraments or by blessing persons or things. In some places it is, in others it is not, worn in preaching, and the custom of the place is to be followed. Deacons wear it at Mass, or at Benediction, &c., when they have to move the Blessed Sacrament, over the left shoulder and joined on the right side. The fees, varying in different countries, which it is customary among the laity to pay to a priest at the time of his discharging any customary function for their benefit – e.g. in marriages, christenings, and funerals. Those who voluntarily, and while in the full possession of their faculties put an end to themselves, are deprived of ecclesiastical burial. But in such cases the canon law inclines to a lenient judgment; and if a person be found, for instance, drowned or poisoned, end it be not proved that he had expressed the deliberate intention of taking his own life, the law prefers to presume some other cause of death, such as the act of a malefactor, or accident, or temporary aberration of mind. In many countries the civil law now requires that persons who have committed suicide, even though the willfulness of the act and their sanity at the time be established, shall be buried in the churchyards. In such a case the ministers of the Church take no part in the funeral obsequies. A society of priests who devote themselves to the care of theological seminaries. They derive their name from the seminary of S. Sulpice in Paris, where they were established by their founder, M. Olier, in 1642. By this is meant the doctrine that the chief authority has the power to ordain and judge in the last resort without appeal in all causes and over all persons, ecclesiastical as well as civil. A garment of white linen worn over the cassock in choir and in the administration of the sacraments. It is among the most familiar, and at the same time is one of the most modern of church vestments. A prohibition by which a cleric is forbidden to exercise his orders or his clerical office, or to administer and enjoy the fruits of his benefice. The Syllabus was a digest or table of the errors condemned on various occasions by Pius IX, drawn up and circulated by his orders. A committee of learned ecclesiastics, appointed in the diocesan synod, numbering not less than six, and (as a rule) not more than twenty members, whose duty it is to ascertain and test the qualifications of candidates for benefices or other Church preferment. They hold office only from one diocesan synod to another. If the committee be reduced below six in the interval between two synods, the bishop makes provisional appointments so as to complete the prescribed number. A small payment in the nature of a "cathedraticum," due from the incumbents of benefices to the bishop.